Size 3 - $59.99 Size 6 - $69.99 Size 8 - $59.99 Only 7 left! Size 10 - $69.99 Only 4 left! Fire departments don't let just anyone join their ranks. A recruit has gotta be tough, fearless, and most important of all, be able to save a cat from a tree like nobody's business! 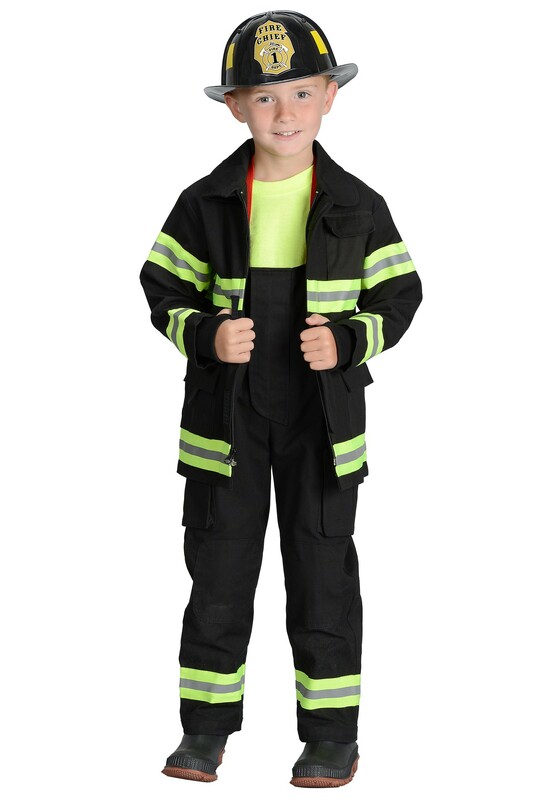 When your little firefighter-in-training is geared up in this Black Fireman Costume, they'll look brave and bold enough to fit right in with a firefighting unit! Firefighters train hard to put out fires, which is why they're so awesome and they get lots of special gear to help them do their job. But when fire crews aren't training or preparing all of their equipment, what do they do while waiting for an alarm to go off to keep from getting bored? Well for starters, it seems like there is always a parade to be in, which helps pass some time and is a good excuse to take the fire engine out for a spin! No matter what they're up to, firefighters are always ready to spring into action at a moment's notice, and your little one is going to look pretty cool as they practice getting suited up in their own gear. 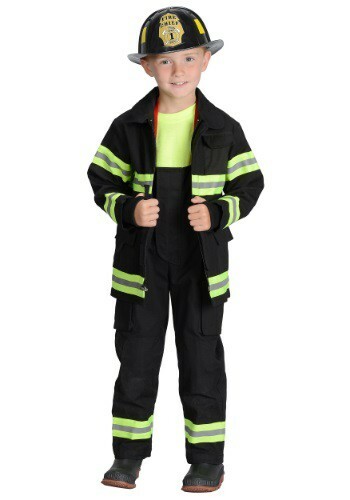 Your kid will look like the real deal in this costume firefighting suit, which comes with a black jacket with realistic details and working pockets, and matching adjustable overalls with metal clasps. Once they put on the included plastic helmet, all they'll need are some boots and a toy fireman's ax to complete the look, and they'll be ready to save the day, whether they're putting out an imaginary blaze, or just helping you get a kitty down from a tree! I was completely surprised at how well made this costume is. It is sturdy and fits perfectly. The hat is even well made! So often, costumes are made of such flimsy material. My four year old got it in the mail yesterday and has not taken it off! My son loved it! Nice quality!